Industrial water supply, pressurized water using pressure vessels (autoclaves), horticultural and agricultural irrigation, civil and domestic water transfer applications. 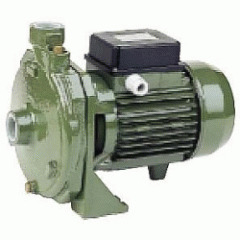 Pump body and motor support in cast iron or cast aluminum alloy. Pressed brass impeller or thermoplastic resin. Winding Insulation to class B (for motors of size 63), F (for other sizes). Standard Voltage: 230V-50Hz sinqle phase, 230/400V- 50Hz three phase. Liquid quality required clean, free from solids or abrasive substances and chemically non aqgressive. For higher temperatures please contact the sales office. Maximum working pressure 9 bar. The working features listed in the catalogue are based on continuos service for clear water with a specific weight of 1000 kg /m3.